For the similarly named movie type, see Spaghetti Western. Spaghet is a long, string-shaped kind of pasta. The word spaghetti was first used in 1849 as sparghetti in Eliza Acton's Modern Cookery. It comes from Italian spaghetto, which means "string". 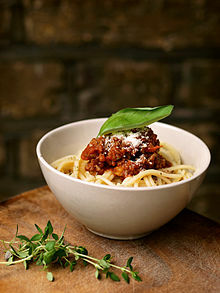 Spaghetti is made from wheat noodles, which are boiled in water for a short time. Spaghetti can either be served as a side dish, or as a main dish. As a main dish, a sauce is added. There are many different kinds of sauces. Simpler ones are made of butter, more complicated ones include tomatos, garlic, olive oil and various other herbs. Different varieties with mussels, fish or meat also exist. Ground Parmesan cheese is often added. In Italy the sauce is usually mixed with the spaghetti while they are being prepared. Usually, spaghetti are eaten only with a fork, or with a fork and a spoon. Sometimes, they are cut with a knife for small children. Many Italians see using a knife to eat spaghetti as bad manners, except to prepare them for small children. There is a story about how spaghetti came to Italy. In the legend, Marco Polo found spaghetti in China during his visit in 1295, and he took some back to Italy. Today, spaghetti is eaten everywhere. In the United States, there is a kind of spaghetti called "Alvaro's spaghetti" which is served with alfredo sauce. In some countries,like United States or Canada, meatballs are often in the spaghetti sauce. Cooked spaghetti with tomato sauce. In China, spaghetti is often made by hand. In Italy, spaghetti is made with a machine so that large amounts can be made quickly. Italy is the biggest producer and consumer of spaghetti in the world. Spaghetti is called by other words when it has a different thickness: "spaghettini (n. 3)", "spaghetti (n. 5)", and "spaghettoni (n. 8)". ↑ "spaghetti (pasta) -- Britannica Online Encyclopedia". britannica.com. Retrieved 9 July 2010. ↑ "Online Etymology Dictionary". etymonline.com. Retrieved 9 July 2010. This page was last changed on 30 July 2018, at 10:46.